“We are in a double-dip recession already.” - George Soros on CNBC. In August, we debunked the idea that companies holding cash was somehow bullish for their stock price. Later in the month, we discussed how value investors fell into a value trap in the early 1930s. Just as a reminder, a value trap is when companies that are cheap keep getting cheaper (and some go out of business!). If we are indeed falling into a value trap and the mass of investors always place themselves in the most danger possible, we should expect the Wall Street selling machine (which caters to the masses) to pump out headlines describing companies as cheap all the way down. Well they have started. As a recent Bloomberg report describes: S&P500 valuations are 25% below the previous last 9 recession - all the way back to 1957. Very compelling! But as usual, when it comes to the Wall Street sales machine one only has to dig into the details to figure out that what seems like a buy of a lifetime is really not. Fortunately, we only have to make it to the second sentence: “Companies in the benchmark gauge for American equities trade at 10.2 times 2012 forecast earnings...” The problem here is obviously ‘forecast earnings.’ This isn’t real money. These are earnings estimates cooked up by the same Wall Street firms who are trying to sell the stocks. And as reported by Ned Davis Research (and noted by other independent analysts across the web), Wall Street stock analysts this summer were estimating the largest growth in earnings in 30 years - which is as far back as we can track. A price will look small if you can make earnings look really big. “As Ned Davis has noted, stock returns are usually considerably weaker beginning from periods with high earnings expectations.” Disappointment = expectation - reality. 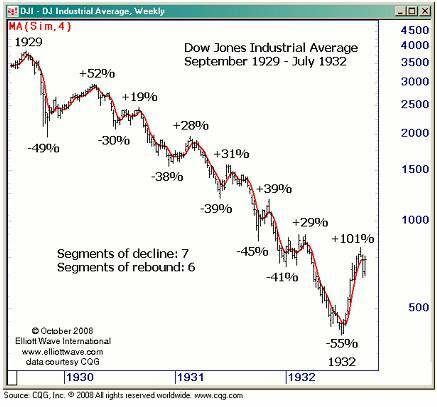 Analysis used to be based on actual earnings in the good ol’ days. However the industry switched to estimates when stocks continued higher in the 1990s past all historical precedent. (Wall Street had to keep the hype machine going in the bull market of the late 90’s - they couldn’t spoil the party by using real earnings). For investors who would prefer to use historically reliable methods for measuring stock valuations, we continue to suggest the Q-Ratio and the Shiller PE. After all, there will be a time (eventually) to buy stocks, the only asset class that outperforms inflation in the long run. As for investors who fall for the ‘cheap’ sales trick, their buying creates the multi-week dead cat bounces like we had in 2008 and which we expect to have many times over the next few years. 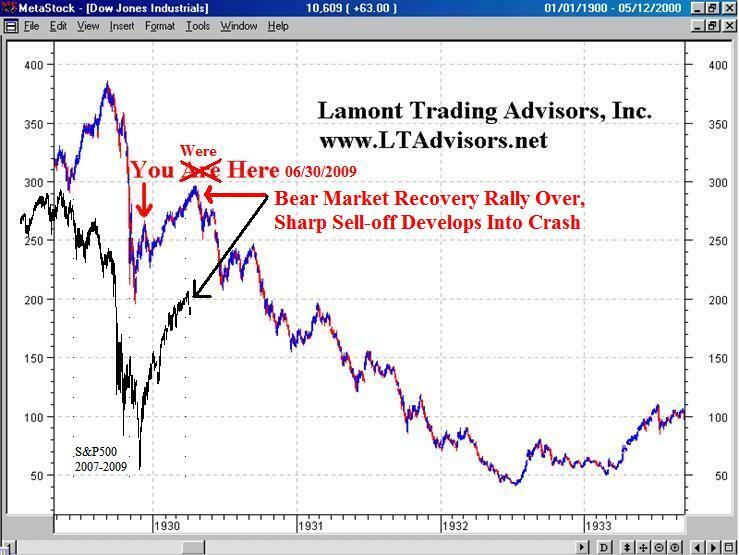 We first used the chart below in June of 2009 (The Great Comparison) to show the similarity of the S&P500 to the market collapse of the Great Depression in 1929-32. Yes, there are timing differences. And while we got ahead of ourselves in revealing the plot last year, we present the updated chart without commentary to prevent ourselves from spoiling the ending. We promise not to flog this dead horse anymore. “There is a big difference between a depression and recession. In a recession, people don’t have as much money to spend as they had in past years, so they cut down on purchases and products decline in price. But business and farming still go on with lower prices. The people have money to spend, just not as much. In a depression, nobody has any money. The farmers still produce crops and cattle but nobody has any money to pay for anything.” - Thoughts and Advice from An Old Cattleman. Gordon Hazard, D.V.M. 2002. Since that time, Bernanke has indeed tried to be supportive with money implementing QE2. Unfortunately, QE2 has boosted bank reserves, but measures of broader money are still stuck in neutral while other forms of lending are still falling. So after a short sugar high in the stock market, monetary policy is just not working. We are still in a liquidity trap. You would think that with the turmoil in Europe, for instance the bank run going on at Dexia, Bernanke would be on pins and needles. Not so. As the Telegraph reports, Bernanke said last Tuesday, “the U.S. is an innocent bystander.” He does however admit “the current situation – which is ongoing uncertainty – has been a negative for our economy.” But what can he do? The interconnectedness of the global financial system is just too complex. For instance, some are suggesting the reason Morgan Stanley’s default risk is so high is because of their exposure to French banks. But others see the Chinese hard landing as more of a problem. So what should Ben do? What can he do? Kyle Bass, a hedge fund manager from Texas, (and who you will no doubt hear much more about in the future because he’s the subject of the new Michael Lewis book) had quite a good discussion on the European situation on CNBC. Good, in that he and I completely agree. It can be found here. “I don’t think a default can be orderly.” - Kyle Bass. Hayman Capital Management.